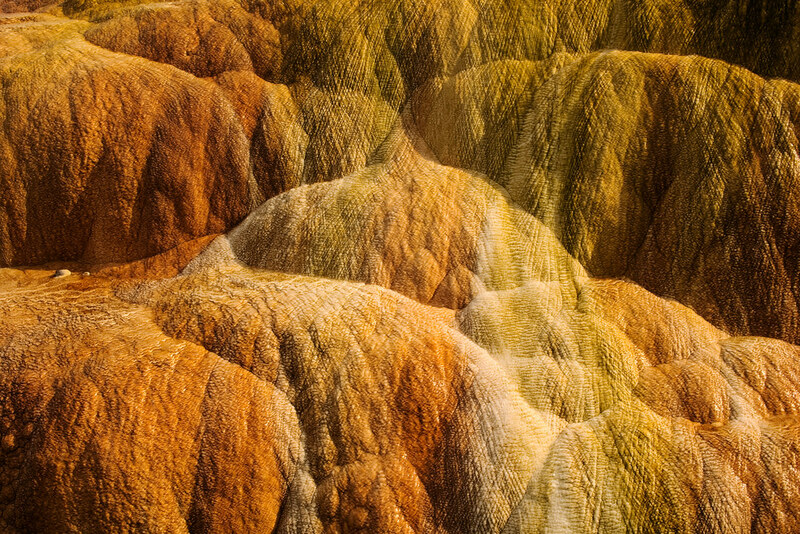 As someone who loves playing around with shapes and colors and textures, my head nearly explodes when I see a scene like this. Sadly I didn’t have a wider lens at the time but I did my best to capture how many different little scenes you could see from this one location. 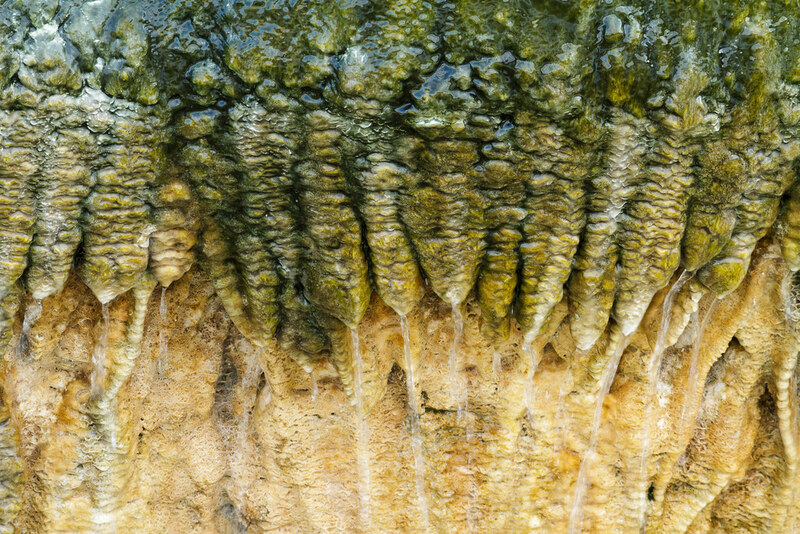 Two of my recent posts (the orange mineral deposits and the watery fingers) were taken from this spot but with a longer lens, plus some other pictures I may post in the future. Mammoth Hot Springs is always crowded since it is both fascinating and right next to the hotel, so as someone who is a bit crowd averse I limit my time here, but otherwise I think I could spend a week wandering around. One of my favorite hiking trails also leads up from near here. 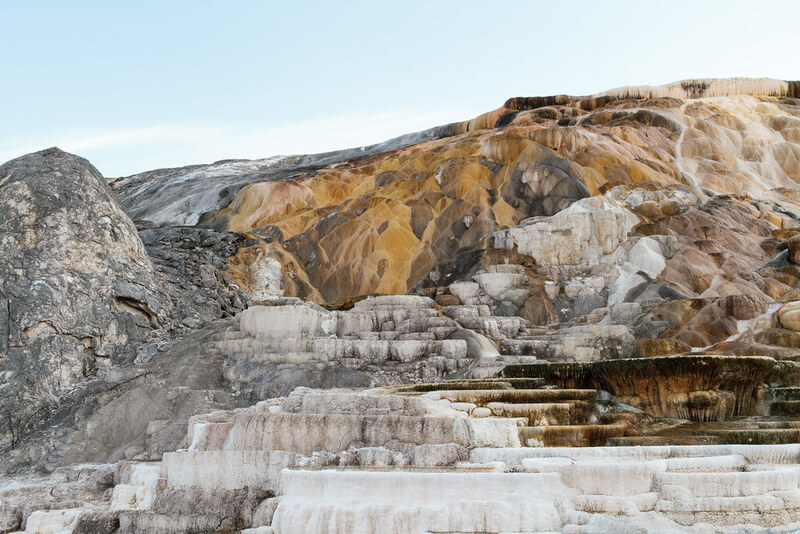 This little section of Mammoth Hot Springs is one of my favorite parts of Yellowstone. The planet is blue but its fingers green, cradling the brown earth and bringing water, bringing life. 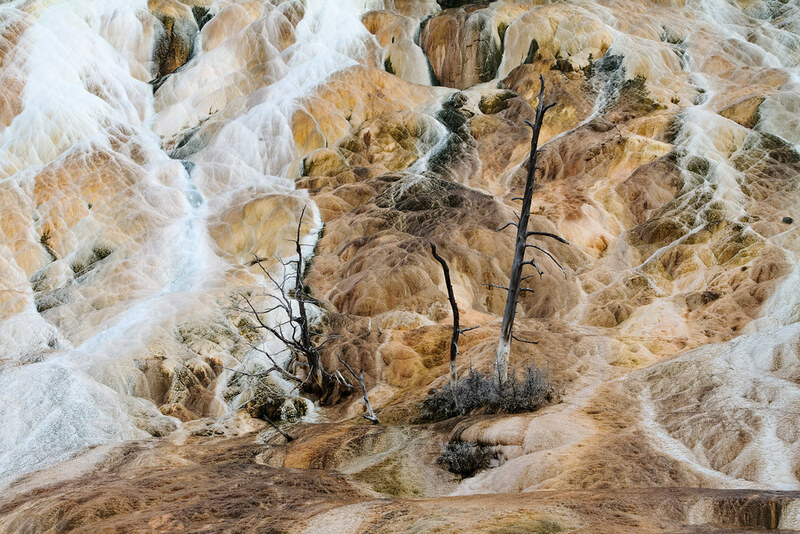 When I saw this scene in Mammoth Hot Springs, I thought perhaps that marshmallows were at long last taking their revenge for all the times they had been placed on a branch and roasted over a roaring fire. 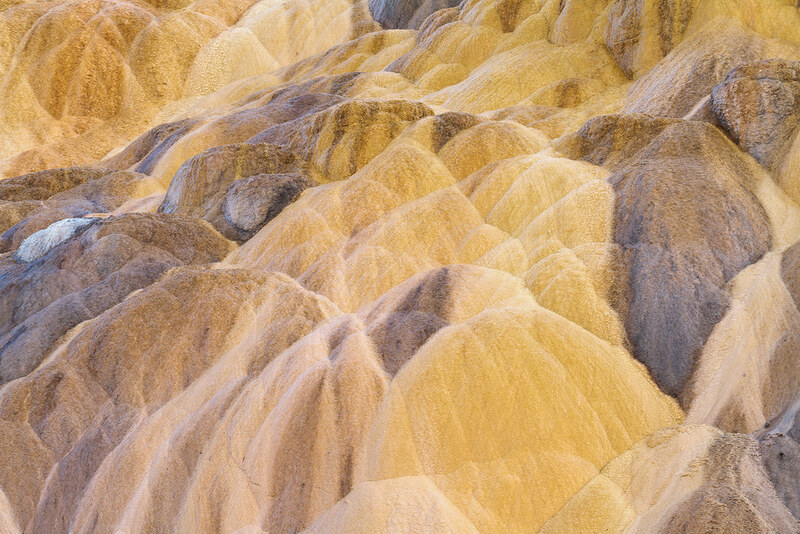 I photographed this little section of Mammoth Hot Springs on my first visit to the area in 2004. I’ve gone back to this spot on each trip since but its appearance has changed over the years and it’s never looked as good as it did on that first trip. The term amateur has both positive and negative connotations. When it comes to photography I love being an amateur, and I love it precisely because of the origins of the term: I get to photograph what I love. While on the way back to my hotel in Yellowstone, I came across a bunch of photographers pulled off to the side of the road to photograph a herd of elk. I took a variety of pictures and was about to wrap up when I noticed a young elk bull down a ways from where everyone else was. I walked down to him and realized why no one else was photographing him: his antlers were stunted. I have a soft spot for animals who have more to overcome, so I settled in to spend the rest of the dying light photographing him. Whether due to diet or disease or genetics, the poor thing wasn’t exactly photogenic compared not only to the dominant bull but even to the other young bulls in the herd. He was mostly grazing but occasionally raised his head and sniffed the air, so I positioned my tripod so that if he raised his head again, his face would be set against the strip of yellow plants behind him. And not only did he raise his head again, but as if on cue he even looked right at me. You’re beautiful to me, little one. 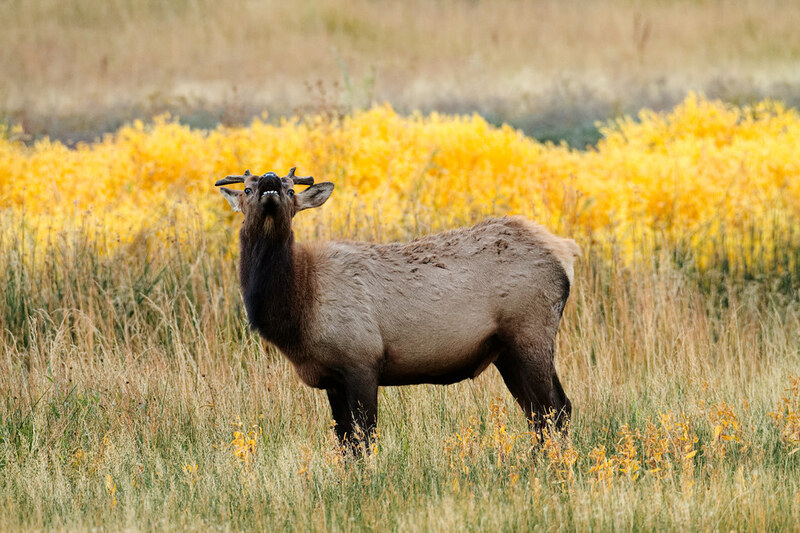 A white-spotted elk calf looks up in the early morning light at Mammoth Hot Springs in Yellowstone National Park.